In my tutorial, I show you how to create my new album design for the "fold-out folio" mini album as shown on in the photo on the left. The album is made of 4 sections that unfold, then each section has its own set of pages that unfold. Each album can hold up to 40 photos on the inside pages, plus more photos on the waterfall. You can put 40 full sized 4x6" photos in the 7x5 album WITHOUT any bulging when the album is closed. The 7x5 album pictured at the top ("Paradise") is the album I constructed as I was writing the tutorial. It is made with the Surf's Up paper stack by Recollections. 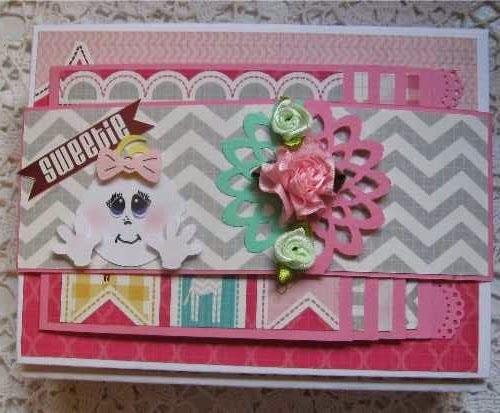 In the videos, I make the pink album with the Baby Girl stack by DCWV. You could use any paper you want to customize your album. I give instructions to make the albums in two sizes: the 7"x5" and the 5-1/2" x 5-1/2" (also seen in the photo above). You can refer to the videos anytime as I plan to leave them online for as long as the service provider can host them. Below is a video that shows the completed albums, as well as additional photos further below. If you have difficulty viewing the video, you can see it on my YouTube channel at https://youtu.be/4WaKUhvE3U0. All four flaps are open. Each of the four flaps contain a folio that can hold up to 9 photos. Here is a photo my latest Halloween-themed album I made following the steps in my tutorial along with a video of the album just below. By purchasing this tutorial, you can make as many of my Fold-out Folio albums as you wish for personal use. You can also make and sell the albums you make. If selling albums online, please credit me by including a link to my website: “Tutorial for making this album is available from www.scrappinrabbit.com”.